Get 20% off Professional Grade Supplements. Click below. Balance Your Brain Chemistry and Get Relief Today! 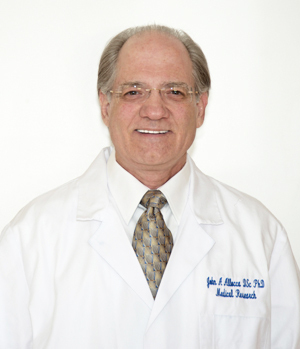 Dr. Allocca's Migraine and Neurotransmitter Protocol was proven in a medical university study. In 1996 Dr. Allocca, a medical scientist and former migraine sufferer, developed a biochemical model revealing the exact mechanisms of action of migraine. He programmed the migraine and other biochemical models into a computer to analyze a person's biochemical pathways and address complications. The software produces an easy to follow step by step non-drug program, which includes a clinically proven, patented, formula that provides the brain with the nutrients it needs to make neurotransmitters. The formula alone is only part of the program. Imbalances in brain chemistry, particularly neurotransmitter levels, have a large range of effects on emotions, behavior, brain circulation, and carbohydrate craving. Neurotransmitters are chemicals that pass signals between the nerves. The neurotransmitters serotonin and norepinephrine send signals through the nerve junctions to the arteries in the brain in order that they may be constricted to a normal diameter against the outward pressure exerted on the walls of the arteries. When there is a loss of neurotransmitters in the brain, there is a loss of signal constricting the arteries, resulting in an enlargement of the arteries, which causes pain and other symptoms. These neurotransmitter levels in the brain can be diminished by allergic reactions, inflammation, poor absorption of nutrients into the brain, poor metabolism of nutrients in the brain, chemicals that deplete them, excessive depletion (over usage), or insufficient nutrients in the brain to produce enough neurotransmitters. Migraine, depression, insomnia, bipolar disorder, and carbohydrate craving have similar mechanisms and pathways, all resulting from a loss of brain serotonin and norepinephrine. Migraine, depression, insomnia, bipolar disorder, carbohydrate craving, and more, have similar mechanisms and pathways, all resulting from a loss of the brain neurotransmitters serotonin and norepinephrine. This customized program for migraine in many cases applies to other areas of brain chemistry imbalance as well. Order Your Neurotransmitter Solution and Customized Program Today! You will receive a kit via U.S. Postal Mail. Complete the questionnaire and urine test. Then, return the form to us for processing. We will process your data and return a complete report and plan to you via U.S. Postal Mail. Consultations by phone and email. Note: In Kindle format, the diagrams and text can get mixed up depending upon the users page size selected. "Beat depression, migraines - and everything in between - with this single serotonin-boosting breakthrough. If you suffered from migraines, chances are good that your doctor's orders have never reached beyond the limits of simple pain management. And, if you suffer from chronic depression, the outlook for a future of safe and effective solutions have become even bleaker, But it's simply not true. And, if nothing else, SeratoninTM's lengthy track record is proof of that." Health Sciences Institute Newsletter, October 2007, Vol. 12, No. 4. Click here "Effects of Neurobiology Formula on the Headaches of Chronic Migraineurs" Erin E. Icenbice, PA-S-Investigator, and Patricia Shull, PA-C, Co-Investigator Eastern Virginia Medical School, Norfolk, VA, June 2002. Note: many people and healthcare practitioners do not understand the diagnostic criteria for migraine. They often believe that a migraine headache is a "severe headache" when it may actually be a sinus or tension headache. The word "migraine" comes from the Greek word "hemikrania", which means "pain on one side of the head." "I suffered from migraine headaches since childhood, spending many nights on the bathroom floor vomiting. In 1995 I tried the so-called miracle drug sumatriptan. I almost had a heart attack from it and it didn't relieve my headache. Furthermore, these drugs have substantial risks. Being a medical scientist, I decided to find a cure for migraine headaches. 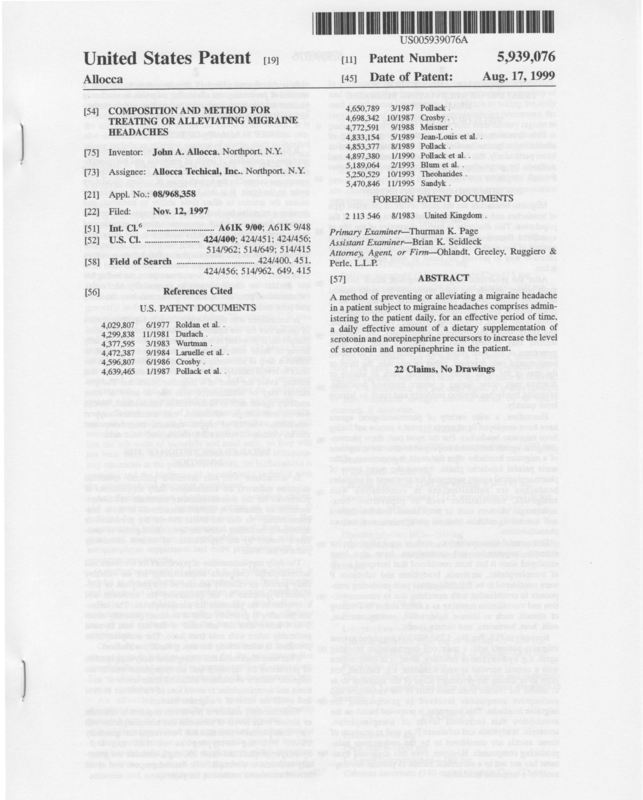 In 1997 I developed the world's first and only biochemical model of migraine headaches, whereby the exact biochemical mechanisms are revealed. I developed a formula and program to prevent migraine headaches. This is a systemic problem, not only a headache . This formula is safe, effective, and proven in a 2002 study at the Eastern Virginia Medical School. It is a wonderful world without migraine headaches. I can actually make future plans and expect to keep them. What are you waiting for? Join me on the journey to migraine prevention today! I can work with you in person or by phone, email, and/or postal mail." Katherine from Virginia writes, Since the age of six, I have lived a life consumed by migraine headaches. I developed migraines in the first grade. Most of the adults in my life doubted the reality of the pain, often saying, "kids don't get headaches." It was not until years later that doctors would prescribe any preventative medication. Later in my adult life, my mother described me as a glassy-eyed child that she felt as though she could do nothing to help. Throughout my adolescence and young adulthood, I was given a variety of seizure drugs, antidepressants and blood pressure medications to prevent these painful episodes. At times, I was having migraines five to six days per week. I became a very meticulous and organized individual because I never knew when the next headache would occur. I was lucky enough to have periods of time when the medications greatly decreased my migraines; however, this was usually short-lived, and I always used a steady stream of strong and dangerous pain relief medications. I experienced very serious side effects which resulted in several hospitalizations. I felt as though I was destined to have a life that was daily determined by my level of pain. I began to accept this as my fate in life and functioned as well as I possibly could. As I grew older and married, my husband and I began to talk about having children. When I consulted my doctors, most of them were very negative and discouraged my ever becoming pregnant. I was told that not preventative medications were safe during pregnancy, and I was either going to have to risk hurting my unborn child or endure the pain. After conducting my own research, I was left with no more encouraging answers than the ones given by my doctors. I was beginning to believe that I would have to make this very difficult and painful decision, when I was given information about the Neurobiology program. I had been praying for a solution to my problem and I truly believe that this program was an answer to my prayers. I called and consulted with such caring and helpful people. They helped me to begin the program within one week of my call. I had no idea what joy and freedom were to come from this decision. I have been on this program for three months. Not only have my migraines been alleviated, but I am now pregnant and continue to be headache free. My OB/GYN has agreed that the Neurobiology vitamins are safe to take during pregnancy and I have had no difficulties thus far. I am now living a life that is not dictated by pain or the fear of it. I am free to make plans without the worry that I may have to cancel them because of a migraine. This answered prayer has changed my life forever. I would recommend Neurobiology to any chronic migraine sufferer, even the ones like me who thought they had tried everything. I feel like a new person, and I would love to share this with as many people as possible. Birth Announcement: Hannah was born on 20 October, 2001, 9:07 a.m., 6 lbs. 7.5 oz, 20.75 inches. 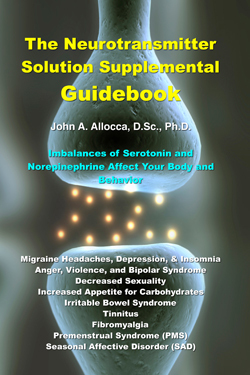 Ron from California writes, Dr. Allocca, I am a member of HSI and read their article about your Serotonin product. While I don't have any migraine problems, I've had a lot of other problems relating to depression and anxiety and panic. Just let me say THANK YOU VERY MUCH for this product. I received it on Thursday of last week and took my first dose of 3 capsules on Friday. I have never felt so good in my entire life. If you should want any further information as to my life experiences that led me to try your product, I will be happy to elaborate. But just let me say that I have had several very traumatic experiences in my life that I have gotten the necessary treatment for. And as far as those things are concerned, I feel that I have dealt with them. However, I have continued to have a sort of anxiety running sort of in the background if you will. Because of this, I have suffered from pains in my stomach, pains in my chest, obsessive thoughts etc. From the first day that I took Serotonin, these symptoms have all disappeared. In their place is a wonderful feeling of positivity, confidence, just an overall wonderful outlook. I am much more relaxed, and in checking my blood pressure, there seems to be an improvement there too. I don't get placebo effects from the things I've tried, and I have tried many. Most all did little or nothing. Particularly the prescription anti-depressants. Again thank you for giving me back my life, I feel REALLY GREAT!